Ever since childhood, the Florida Everglades have been a special place to me. As a young child, I spent many hours on my grandparent’s chicken farm, which was located on the edge of the ‘glades. And as a Boy Scout I frequently hiked, canoed, and camped in them. One of my favorite areas is a place along the main road in Everglades National Park: Pahayokee. In cross-section, the Everglades are shaped like a shallow spoon. The edges of the spoon are ridges of old coral reef. It is on those ridges—those relatively high and dry areas–that the most populous cities of Florida are found: Miami, Fort Lauderdale, and West Palm Beach on the Atlantic coast, and Naples, Fort Myers, and Tampa-St. Petersburg on the Gulf side. The broad belly of the spoon, in contrast to the salty coasts, is a fresh water environment. It is a wide swath of slow-moving water, sawgrass, and cypress trees. Alligators like this portion of the Everglades too, but never mind that. I drove down to Pahayokee from Miami, arriving just before dawn. I parked on the grassy shoulder of the road. As usual, before wading out into the wet, sawgrass plain, I took a few minutes to walk up and down the road edge to look for alligator trails—and for their scaly residents. I’ve seen both in this place before. On this morning, though, the coast was clear. No large critters that I could see. So I took off my shoes, shouldered my camera bag, grabbed my tripod, and waded into the calf-high water. For the most part, cypress here are part of an extended, if scattered, forest. What I wanted, though, was to find some that were standing apart from the rest. I hoped to discover a group that, first, presented itself as shapes. Secondly, I wanted them to be apart from the main forest so that there were few, if any, visually distracting background elements. Just as the dawn sun was rising under a lightly dotted mackerel sky, I found three nicely sculpted trees. I opened my tripod and, extending its legs down into the water, firmly planted its feet in the mud. Due to the high contrast of a bright sun subtropical morning, and the overly bright highlights and extremely deep shadows that often come with that, I decided to take three exposures. One captured the mid-tone lighting. The second recorded detail in the shadows. And the third correctly exposed highlight detail. In essence, I was employing the Zone System developed by Ansel Adams and Fred Archer. Later, I combined those multiple exposures to create a single image with a full dynamic range of tonalities. 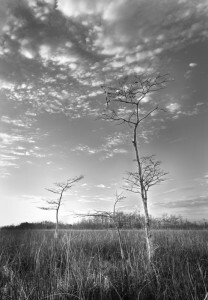 For me, this photograph represents the look and feel of the interior Everglades. It is a special area of unusual plants and animals, a region where beauties are many. You often have to look closely to find them. Those searches are frequently rewarded in wonderful ways—as they were for me on this beautiful morning of soft light, delicate clouds, and the comfortable sensation of water on my skin.